Community Groups are one of the four spiritual formation environments of Restoration Church. Each one is designed to help people grow in experiencing the restoration of the Gospel. This means someone is living the life God intended for us and it occurs when a person trusts in and follows Christ, goes through the waters of baptism, becomes a covenant member, and follows Jesus as a lifelong disciple within the context of community. Making disciples is what the Church has been called to do by Christ Himself(Matthew 28:19-20). Ultimately, we know we are being successful as we see people embody our four core values, grow in the five outcomes, and teach others to do the same. 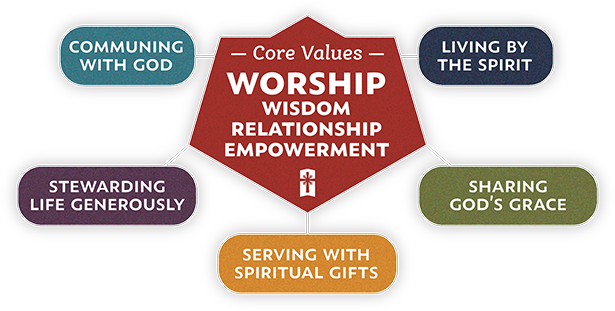 This is represented in our core values and outcomes graphic shown below. Experiencing the restoration of the Gospel is only accomplished when we are lifelong disciples of Christ. Therefore, the overarching goal of each spiritual formation environment is to empower others by helping them grow, be held accountable, celebrate God’s activity, and collaborate together in following Jesus. In order to accomplish this, our formation environments strive to train people cognitively (mind), practically (will) and personally (heart). This leads us to our first question regarding Community Groups. Community Groups exist to help accomplish the vision of Restoration Church by helping people gather in smaller communities in order to grow and go. Community Groups play an important role in how we live out our vision by helping others grow as a disciple and go out into the mission within the context of meaningful Gospel-centered community. Lead by qualified, trained and accountable leaders, Community Groups provide the time and space to interact more deeply with God’s Word, the values, and the outcomes, one another and the community. They also provide a span of care so no one feels left out or forgotten. Finally, they are a strategic vehicle enabling Restoration Church to be decentralized throughout our community, which makes the Gospel more accessible to different neighborhoods. Community groups spend time in God’s Word so they can grow in their knowledge of God, be transformed and walk in joyful obedience. Community groups spend time discussing, praying and planning how to participate in sharing the Gospel with others, personally and collectively, in both word and deed. Community Groups spend time in prayer to worship, display our dependence upon, and appeal to God for ourselves and others. Community Groups provide and environment for people to develop relationships that can bear truth and administer grace through sacrificial generosity toward one another. When do Community Groups Meet? Community Groups meet either weekly or bi-weekly from September to June. They are encouraged to meet at least once in July and August in order to maintain connection with one another. Ideally, Community Groups meet in the home of someone in the group. It does not have to be the home of one of the leaders, however the leadership should ensure a meeting location is secured. Groups can also share the responsibility of meeting by rotating on a somewhat regular basis. A word of caution for the rotation method is to refrain from rotating too much as it may cause confusion and hinder group momentum and cohesion. A suggestion of one home a month or two months would be better. Who can be part of a Community Groups? Anyone can be part of a Community Group. However, if someone in the group is going to invite someone to the group, it is best for the group to be prepared a head of time. Community Groups are meant to be so much more than fellowship times or Bible Studies. They are meant to be smaller representations of the broader body, the vision and to help people become and live as a disciple of Jesus Christ. Therefore, success is measured by how the group as a whole and how individuals are growing in experiencing the restoration of the Gospel… nothing more or nothing less. Community Groups are a powerful vehicle for seeing our community saturated with the Gospel and mobilizing others to be fully devoted Christ followers.